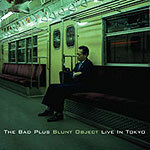 CD review: "Blunt Object: Live in Tokyo"
Since coming on the scene a few years back, The Bad Plus have released two studio albums that earned them glowing press and a rabid if small following. Neither traditional jazz nor rock 'n' roll, The Bad Plus is carving out its own niche in the music world. Noted for their jazzed-up covers of rock standards  "Smells Like Teen Spirit," "Iron Man"  and haunting originals, The Bad Plus performs every song with an assertive, almost aggressive (heck, sometimes belligerent) driving pulse-like beat. A lengthy vamp on their original song, "And Here We Test Our Powers of Observation," captures the band's very essence: spirited technical improvisation a la Stan Kenton or Charles Mingus with a muscular backbeat that rivals War or the Allman Brothers. In addition to live versions of songs from their first two albums, there are two new covers: Queen's "We Are the Champions" opens the set with a sombre, almost rueful interpretation that drips melancholy and regret  stripping out all the joy and bravado that filled Queen's performance from the first three and a half minutes before rallying for a spirited closing. Pianist Ethan Iverson takes over Freddie Mercury's high-octane vocals, and plumbs depths and nooks never dreamed of in the original. And the set closes with an equally inside-out version of the jazz chestnut "My Funny Valentine." The cut begins with David King dancing his sticks across his toms while bassist Reid Anderson puts down some very funky figures on bass. Then one of the trio, uncredited, provides a vocal that is far closer to Yoko Ono than Chet Baker. As with everything else here, in the end the only thing any of us can really say about this very odd take on a classic is that it's The Bad Plus.